Berlin, Cologne, Dusseldorf, Hamburg or Munich, in every big city in Germany, there is at least one car sharing service. Berlin’s leading with a fleet of 2,350 cars (actually, several fleets from competing services). 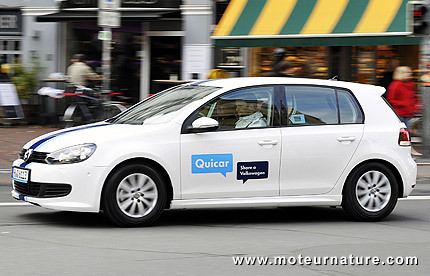 Some cars are electric, like those from Multicity, others at Quicar are standard Volkswagen models (our illustration), but the service with the most vehicles is car2go, which rents little Smart cars. Some people may still question how successful those services are, but some impressive data will answer them. If we add the number of customers from all car sharing companies in Germany, that now makes 200,000 people! A business with more than 200,000 customers is a serious business and the most impressive is the growth rate. In Berlin alone, last May, there were an average of 60,000 trips per week, which is 377% more than the year before. You don’t need to look further to understand that the biggest investors in car sharing are the car manufacturers themselves.